In the latter half of the 19th century and until the First World War, the belt was a decorative as well as utilitarian part of military uniform, particularly among officers. In the armed forces of Prussia, Tsarist Russia, and other Eastern European nations, it was common for officers to wear extremely tight, wide belts around the waist, on the outside of the uniform, both to support a saber and for aesthetic reasons. These tightly cinched belts served to draw in the waist and give the wearer a trim physique, emphasizing wide shoulders and a pouting chest. Often the belt served only to emphasize the waist made small by a corset worn under the uniform, a practice which was common especially during the Crimean Wars and was often noted by soldiers from the Western Front. Political cartoonists of the day often portrayed the tight waist-cinching of soldiers to comedic effect, and some cartoons survive showing officers being corseted by their inferiors, a practice which surely was uncomfortable but was deemed to be necessary and imposing. In some countries, especially the United States, a father's belt can be associated with corporal punishment. 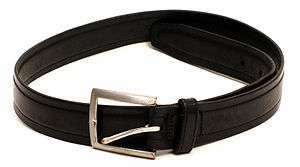 As belts are constructed out of materials like leather that are both strong and light, a belt can be easily wielded to produce intense pain by using it as a whip to strike the buttocks of a misbehaving child. 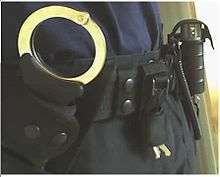 Moreover, belts are convenient disciplinary tools, as they are generally immediately available for use. The belt can symbolize fatherly authority and paternal responsibility for one's children's behavior and moral development. Since the mid-1990s, the practice of sagging has been practised at times among young men and boys. This practice is sometimes incorrectly believed to have originated with prison gangs and the prohibition of belts in prison (due to their use as weapons and devices for suicide). A common sight in fantasy and role playing characters is the excessive use of belts in all different sizes on the character's person. Usually they are used for securing clothing or armor, but others just have several belts around the arms, legs, neck, waist, hips, and across the breasts for decoration. Sometimes they are used in place of eye patches or to decorate weapons. This was also common in superhero costume design of the early 1990s. ↑ See pictures File:NY Metropolitans.jpg or File:1868 Reds.jpg for instance. ↑ Most expensive belt in the world? How about $249,000!